What factors make someone leave their job to become an entrepreneur, and how can organizations get these inventive souls to stick around instead? On this episode of Mastering Innovation on Sirius XM Channel 111, Business Radio Powered by The Wharton School, guest Carl Schramm, professor at Syracuse University and former President and CEO of the Ewing Marion Kauffman Foundation, shares his experience empowering change across various industries. Large, established organizations are constantly working to stay innovative, from Amazon scouting a new location for its second headquarters or the University of Pennsylvania searching for new technology applications through its Y-Prize Competition. Would-be innovators, however, often face obstacles to change that cause them to flee. These include managers unwilling to rock the boat and companies hesitant to digress from the working model of success. Schramm discussed the importance of motivating talented individuals with meaningful incentives in order to create new and profitable ideas. Nicolaj Siggelkow: When I’m running a large company, I’m scared that all of my highly skilled long-term employees are leaving to start their own companies. What are some of the reasons? If I run the large company, I want to keep those people, so what can they do outside that they cannot do inside? What advice would you give to firms to say, “Look, I know you want to have innovation,” and you have all these innovative people, apparently, but they’re leaving you and creating new companies? What can firms do to keep them? Carl Schramm: There are three different ways to approach that question. First, a lot of what I’ve seen is – and I recount some of these stories in my book – a lot of times, firms go back to a core competency or they decide that they’re going to actually concentrate in one area. Suddenly, things that they had thought were strategically important aren’t business lines, and they dispose of them. The people who’ve been able to grab those at the big company have actually become great entrepreneurs because they actually have a growing business, and they generally know it. It’s a little easier to raise scale capital to keep that going. Second thing is that a lot of employees who start companies are terribly frustrated. Mind you, many of the entrepreneurs leaving have particularly long job tenure. They’re really loyal, and they get extremely frustrated that their vision of what innovation could do to change the course of the company is frustrated — often by managers. I often see this is the tension between the innovative engineer and the MBA manager — who’s working against the strategy in ways, core competency running through his head all the time — versus the engineer who basically sees technology in new markets all the time. The third thing is really a very interesting question. I don’t really have a good answer to it, but it’s the question of the hour. How do big companies actually capture all this innovative spirit? These innovators are very disruptive. I’ve seen again and again — hunting down the innovator and making sure that you stop their disruption, really getting them out of the company. There are a lot of companies where it’s not a friendly territory if you’re too innovative. Companies just don’t know how to operate with that. In a sense, we need the next Max Weber to come along and tell us how to deal with fluid bureaucracy. Saikat Chaudhuri: Carl, I was very intrigued by what you’re saying, not just the focus on people, but also how on one hand, things are systematic inside corporations in order to promote entrepreneurship and innovation, and it’s so dependent on people that have been there for a long time. Entrepreneurship and innovation, especially in the corporate environment — can people learn that? In other words, is it that one day these people wake up and say, “I just want to be an entrepreneur because I have the inherent attributes” or [that they say], “I’ve seen something. I’ve learned something in these companies, which then enables me or motivates me to become an entrepreneur inside or outside the firm”? Schramm: I think the latter case. I’m not the person who believes that entrepreneurs are born, and then they discover [that they are]. 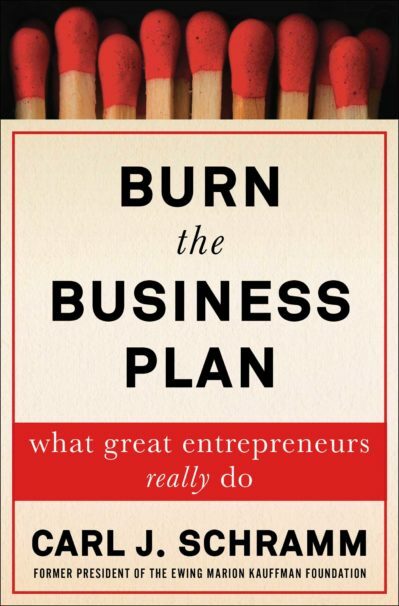 Almost all, if not all, of the entrepreneurs in my book were taken by surprise when it occurred to them that they could (or had to) start a business. What do businesses do about that? I’ve been wrestling with this for a while with a couple of clients, and in a sense — and I hate to use this phrase because it comes from politics and doesn’t really belong in business — it’s almost like there has to be safe space for entrepreneurial employees. That is, for people who discover. So, I don’t think you march through the ranks of all the employees saying, “If you’re an entrepreneur, we love you. We’ll help you. We’ll send you to school to get a degree in entrepreneurship.” I don’t think it works like that at all. There has to be some sensitive gate for people who actually are at an innovative period of their life where they see things that managers can’t, because they really are at industrial meetings. They’re reading technical journals. They’re talking to each other so informally, and you know exactly what I’m talking about. Every manager is listening about this because, once upon a time, they might have been down there, particularly if they were engineers. Carl J. Schramm is University Professor at Syracuse University and former president of the Ewing Marion Kauffman Foundation. 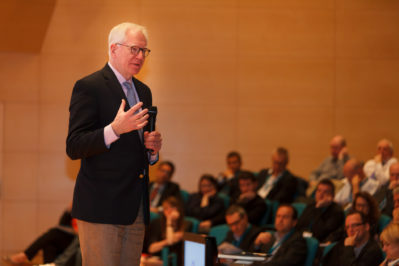 Schramm has served in major corporate roles and chaired the US Department of Commerce’s Measuring Innovation in the Twenty-First Century Economy Advisory Committee. He was also a member of the President’s National Advisory Council on Innovation and Entrepreneurship. He lives in New York and Florida.